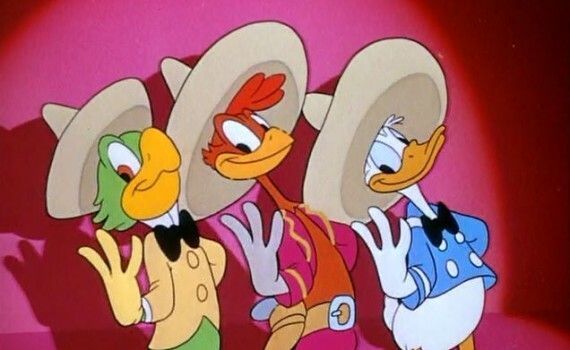 Forgotten in the Disney shuffle is The Three Caballeros, a fun if weird animated musical adventure featuring the legendary Donald Duck and his two, new, Latino, avian friends. I watched this movie many times as a kid with my sister, laughing over the silly prat falls but enjoying a strange & wonderful romp through the imagination of Walt Disney. The Three Caballeros will never be as loved as some of the classic films we still watch with our kids to this day, but it has its unique place in history, which might make it even more important. And perhaps equally important, to me anyway, is the impact this movie had over my young cinematic mind, leaving a lasting & amusing impression. It’s Donald’s birthday and we’re all invited! The famous duck has received a unique gift from his friends down south; an explosion of culture & festivity for us all to enjoy. First up, we travel to South America, to where a penguin has always dreamed of relocating and a young boy has just encountered a flying donkey. Jose Carioca, a suave Brazilian, will guide us on our way across his beautiful continent. Next we head to Central America, to the dances and the excitement of Mexico, where a rooster named Panchito will show us the sites. The three new friends, these three amigos, will experience more in one night than most of us do in a lifetime, gathering together people of all nationalities to celebrate the wonderful culture of Latin America. After a series of megahits like Pinocchio, Fantasia, Dumbo, and Bambi, Disney and the rest of the American film industry went through a decline. WWII took our focus away from the theatre and onto the world stage. The result, fewer movies made and no big projects from Disney from the mid to late 40s. Instead, the company focused on collections of shorts like The Three Caballeros and live-action films like Song of the South. They wouldn’t rebound until the 50s with Cinderella, Alice in Wonderland, and Peter Pan, returning to normal blockbusters just like that. So this film is an oddity, but an enjoyable one, especially given why it was made. It’s fun, it’s silly, you learn a little bit about Latin music, and you get to watch Donald Duck act the fool. I remember loving it as a kid and my kids called it the funniest movie they had ever seen, so Disney, although forcibly off their game, was still able to get it right.